your tweet button had to be always floating at a reader’s sight, reminding him of that option. But it all changed when someone invented “tweetable quotes”. What is a tweetable quote? “Tweetable quotes” are great ideas compressed into short insightful sentences, that bloggers embed into their articles to make their readers want to tweet them. And as you may already know, people love tweeting things that make them look smart – this is how tweetable quotes help your articles spread on Twitter and drive more traffic to your site. For example, Neil Patel wrote a very short article with nothing but 50 short tweetable quotes in it, and it resulted in 17,452 visits from Twitter alone. 1. It clearly stands out from the rest of the copy and catches the eye. It is a well known fact that only a small percentage of visitors who land on your article will actually read it from start to finish. Most of them will only skim through to understand what’s in it for them and if it is worth their time. That’s why it’s so important to make your tweetable quotes stand out. Even if that person won’t read your article from start to finish, he may notice your quote and tweet it out, exposing the link to your article to his Twitter followers. 2. It conveys a great idea in a single catchy sentence. 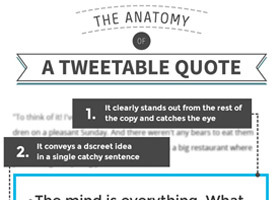 While your headline has to capture the essence of the entire article, you can use multiple tweetable quotes to convey a bunch of great ideas that you’ve planted there. 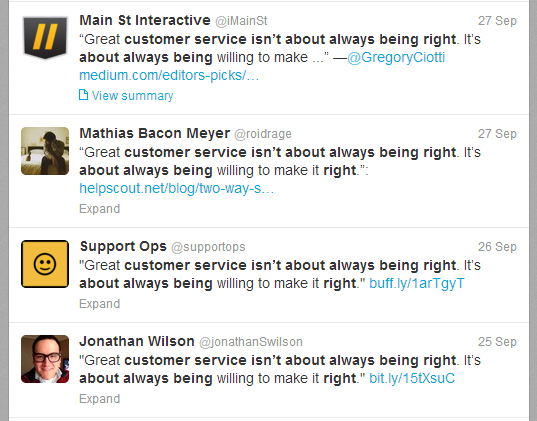 This is why you should try to use more than one tweetable quote in your article (if possible). Even if your headline won’t resonate with the reader, one of your catchy “sound bites” should definitely strike him. This way you’re creating multiple opportunities for your readers to share your content on Twitter. 3. It has a clear call-to-action. I won’t go into too much detail on why “call-to-actions” are so crucial in online communications. Everyone knows that. I’ll just remind you that 99.9% of your website visitors will never take action, unless you will clearly ask them to do so (I totally made up this number, but you get the idea). That is why next to each tweetable quote you see a short call-to-action that says “tweet this“. 4. It can be tweeted with a single click. You can come up with the most amazing quote in the world, but if your readers don’t see a quick way to tweet it – many of them won’t bother doing it. That is why tweetable quotes are designed to be tweeted with a single click (I’ll cover the technical side of things later in this post). Since I have promised you to only share “no-BS” advice here on BloggerJet – let’s be realistic. Embedding lots of tweetable quotes into your articles will NOT help you get more traffic from Twitter. Embedding amazing, insightful, inspirational quotes… the kinds of quotes that change people’s lives… the kinds of quotes that you print out and hang on your wall – THIS is what will generate tons of tweets and help you get more traffic from Twitter. I mean if your quote is nothing special – no one will ever tweet it (even if you carefully follow all the anatomy I’ve outlined above). But if your quote is a killer – many people will tweet it out even if there’s no quick button to do that. He has planted a big and bold quote into his article, but he didn’t make it “tweetable”. Readers don’t have a button they could click to send his quote to Twitter. So did people tweet it out? It is the actual quote that makes people want to share it with others, not the “tweet this” button that you put next to it. “Tweet this” button will surely help you to squeeze more tweets out of your quote, but it won’t magically turn your nonsense quote into a viral sensation. 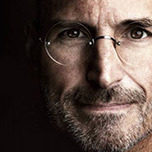 So how to write great quotes? First and foremost, think of the actual idea that you’re trying to convey in your quote. If that idea is “contagious” and “sticky” – that’s already 80% of the success. Another 20% goes to copywriting (your ability to write damn good sentences). Writing quotes that others will want to cite is incredibly hard. Luckily there’s a cool hack that you can utilise if you can’t come up with a sticky quote to use in your article – find a relevant quote from someone popular! Once your readers see a great quote authored by some authority person they know – they simply can’t resist tweeting it out. As you can see, tweetable quotes strategy works like a charm for my small personal blog, and I’m pretty sure it will work for you too. Finally, let’s talk about the technical side of things (which is the easiest part actually). Below I’ve listed three different solutions that will help you add tweetable quotes into your articles even in you’re not a techie. And I’m such a big advocate of this strategy that I have invested my own time and money to create one of these solutions. 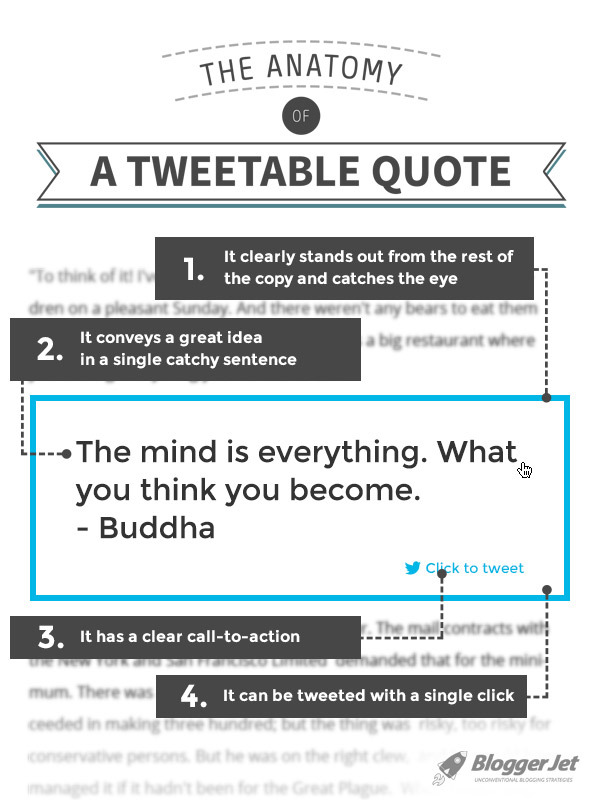 This is probably the fastest way to start using “click to tweet” quotes in your articles. Then copy the code that this tool will give you and paste it into your article where you want your tweetable quote to be. But I guess you also want that tweet to mention your twitter username and include the link to your article, right? You can easily add something like “by @timsoulo” to the text of a pre-populated tweet, but what about the link to the article? If you’re adding a quote to an existing article, it’s not a problem to grab it’s URL and add it to the tweet. Visually both of these “click to tweet” links look the same, but if you click on them, you’ll see that the second one generates a tweet with my twitter handle and post URL in it. I perfectly understand that this is their way of promoting their service, but wouldn’t it be more relevant to recommend following the owner of the blog instead? All in all, ClickToTweet is a great service to create basic tweetable links and put them into your articles. But you’ll have to mess around quite a bit if you want to add some extra information to your tweet and the tweetable quote won’t really stand out in your content as you can see. This plugin has the same name, but it was developed by guys from CoSchedule, who seem to have no relation to the aforementioned online service. If you’re new to WordPress plugins and have no clue of how to install one on your blog, check this awesome tutorial by WPBeginner. Basically they give you a code that you should use in your article editor to make a phrase tweetable. Once you wrap a piece of text with that code the plugin will automatically attach the url of your post and your twitter handle to it. I don’t use ClickToTweet plugin at BloggerJet, so this is just a screenshot. It looks very nice and overall the plugin is very easy to use. One little downside of using this plugin is that there’s a “Powered By CoSchedule” link added to each tweet box that you create. Again, there’s actually nothing wrong with it. These guys give you their plugin for free and all they ask in return is a little bit of promotion. So overall the plugin is very handy and cool, but there’s only a single design of a tweetable quote available. This is a WordPress plugin that I have created for myself, because I didn’t feel that any existing solution could meet my personal needs. 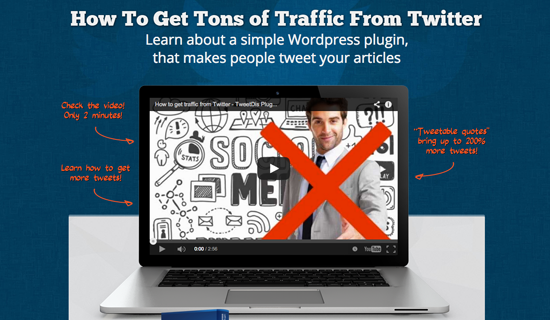 TweetDis plugin is much more powerful than the two other solutions that I have described above. 2. If you want people to tweet a quote that’s a part of a paragraph, you can use a HINT. But my absolute favourite feature is ability to add quotes with “faces”. We call them “authority quotes”. Feel free to browse TweetDis website for more information about the plugin. So have you heard about “tweetable quotes” before? What do you think of this little marketing tactic? This is my first visit to this blog and I am glad to be here. Being a blogger and SEO-SMO professional your blog has lot more information for me. Just like your this post will help me in making my posts more eye catchy and interesting for my readers. Hey Yogita! You’re absolutely welcome and I’m glad you’ve enjoyed this article! I like to add ‘click to tweet this’ links in my posts – I’ve been increasing my use of them but have yet to track any huge gains in social shares. I don’t like using plugins or third-party services though – I just code in using basic html myself. Even if you can’t code, just grabbing the raw code and changing the message is easy enough. Thanks for sharing this Yogita. Do you use ‘share this to Facebook’ and other social sharing links too? Hey Stuart.. I think each way of adding clicktotweet links has its own benefits and its own flaws.. To me my plugin is obviously the best :) And still I keep working to make it even better! I really like that you gave the others a fair review in the same post where you suggested your own. Normally I wouldn’t buy a plugin like this but hints of character impress me. Hope you have an affiliate program. Yeah, I’m not the “sleazy salesman” guy, who will try to push some useless stuff to you, while there are other fair options to consider. I prefer to make people buy my work because it’s better than everything else, rather than trying to make it the only available option. Both ClickToTweet online service and the WP plugin are very good options and many people will prefer using them first.. and then they might consider trying out TweetDis, which is a bit more powerful. I’m actually not very computer savvy person and I mostly have professionals mess with all the code, but what you did there looks very good. I was fascinated to see one such implementation on one of the problogger’s blog. Your article have showed a way for me to get this on to my blog too. Thank you for sharing! Sudhir guy does it implement your knowledge. I’d seen those click to tweet links quite often in many blog posts but never got time to check how they are created. Click to tweet is really a nice feature to offer to your readers and if you’ve composed the tweet message nicely, it can be a great aid to make your post go viral. Among the different methods, I liked the first one even though it has some extra work involved. I prefer not to install any plugin as far as it is possible. A minimalistic WordPress installation makes the blog much smarter with faster performance. If it was a code hack, that’d be much better than plugin. Another reason why I don’t recommend to use plugins is that they generate custom shortcode and insert in the post text. When the plugin is uninstalled in the future, all those shortcodes are a headache. Thanks a lot for such a useful post and reference to the tools. I’ll try to insert some tweetable quotes in my coming posts. A big thumb up! Hey Suresh, yeah.. I totally support you and most of what you see on my blog is not plugins, but scripts hardcoded into my theme.. But if you want to have good looking tweetable quotes on your blog with lots of cool perks, I’m afraid plugin is the only way. Neil generated some sick numbers. Tweetable quotes pop up all over the place these days. I may use it to generate some more twitter traffic. Fun way to break up your post too. Images, different fonts and these plug ins – or code snippets – make your blog pleasing to the eye. I love twitter too. With minimum engagement driving steady traffic to your account and through other user accounts is a breeze if you promote others as freely as you promote yourself. That’s the great secret. Give, receive, and add those snippets or plug ins to make tweeting quotes easier. Hi Tim, thanks for sharing this post. Twitter plays important part for the online world. I would like to try this tools and plugin, especially the free one. LOL. These steps really helpful to create Tweetable Quotes, Twitter can be a great tool for interacting with customers and market your goods. But it is an equally efficient tool for collecting customer feedback and their opinions about your company’s products and services. Thanks, this is a super handy trick! This is a fantastic add to any blog, thank you for sharing this tool. I can only see good things happening after adding it to my set-up. 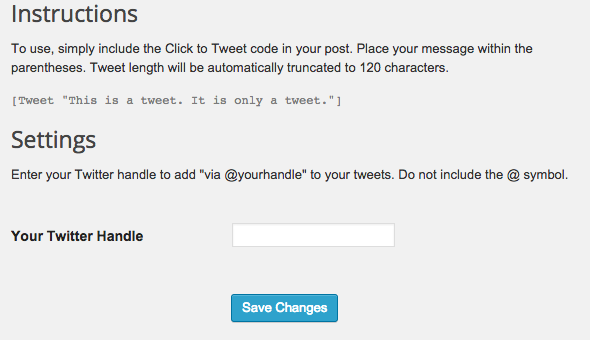 I just can’t seem to find the “Click to tweet” plugin by coSchudule, like you suggest. Any idea why that is? Hi Tim. I use Better Click to Tweet. Don’t know if its better than the above, but I like it really well and its free. It’s simple to use and looks good. Your plugin looks great, too. I’ll have to keep it in mind for down the line. Thanks for your helpful review. Thanks! Great article. I’ve been meaning to add the “click to tweet” quote element to my blogposts. I know they work as I’ve tweeted out lots of times using the easy format. I’m drawn to stats. Example: 85% of bloggers ____ when should be ____. I love stats. Hey Tim, you won’t trust but I’m here while obesrving a site on ahrefs. I must say your wirting style is more than better. :) Hope to read more post at this blog.